The Red Bulls have locked out the front row for tomorrow's British Grand Prix. But don't let that fool you - this was no run of the mill 2011 qualifying session. For one thing, the chasing pack, in particular Fernando Alonso's Ferrari, were in much closer attendance than usual. For another, for once, it's Mark Webber who claimed pole. The Australian has looked confident behind the wheel all weekend, including in the perfidious conditions experienced during much of practice. The qualifying session, like every practice session here, was impacted by rain showers, though slick tyres were still what was required. Webber pipped team mate Sebastian Vettel by less than half a tenth of a second, making it only the second time this year Seb has missed out on fronting the grid (the other time being in Barcelona, when Webber again sneaked ahead of his team mate). Reports of the Red Bulls' death, with the new interpretation of off throttle blown diffusers supposedly being the bullet, were somewhat exaggerated then. For all of that talk, it shouldn't be forgotten that the Red Bull is a fundamentally very good racing car, and it was going to take more than that to usurp them. But it was still the case that the chasing pack, especially the Ferraris, have been brought closer to them, at a track considered to be firmly Red Bull country. Whether this represents the new off throttle blowing regs benefiting them particularly (there's been some dark muttering that it has), or their technical upgrades being particularly fruitful, or both, depends on who you're talking to. Fernando Alonso lurks menacingly in third place on the grid, but a tenth shy of Webber's time, with team mate Massa, usually hot off the starting line, alongside him. The Ferraris have been stronger on a Sunday than on a Saturday all season, so I suggest you keep an eye out for them, Alonso especially, tomorrow. The exhaust regulation issue still has some way to run, but the Scuderia could give the Bulls something to think about in the races at least in the season's remainder, if not the championships. And don't forget that Alonso has two (close) second places in the last three races, and could well have won the other given a dry day - so they were coming on strong even before the off throttle blown diffusers rose to celebrity. One team who definitely didn't benefit from the new exhaust spec was McLaren. They struggled for pace throughout and Jenson lines up fifth tomorrow, and second and a half shy of Webber's time, and Lewis tenth (amazingly, the lowest British driver on the grid, Di Resta did magnificently to qualify sixth). McLaren once again goofed up Lewis's qualifying strategy, him being sent out on used tyres at the start of the final session, and a late (but expected) rain shower meant he couldn't do another quick lap. It perhaps is little wonder that Lewis seems so frustrated right now. It's also worth wondering where McLaren might have been if Mercedes hadn't won their exhaust concession for this weekend. Which brings us neatly onto the off throttle blown diffuser debate. Not entirely unexpectedly, it had some legs today as well. This morning the FIA, quoting their rules, pointed out that they can't accept new evidence/arguments from teams over regulations after 10am on a Thursday before the meeting. This is fine, but it makes you wonder why they didn't realise this yesterday. Therefore, the concession they offered to the Renault powered teams yesterday was dramatically un-offered. 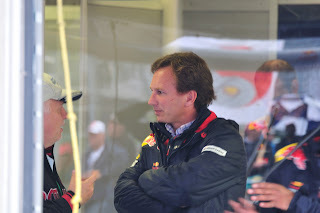 Christian Horner and Adrian Newey of Red Bull (who use Renault engines) were mysteriously absent from the pit wall in morning practice, as they were seemingly having a major whinge at the FIA's Charlie Whiting, before emerging with faces that could stop a clock. A meeting of all teams with the FIA followed between practice and qualifying. The outcome was (and is) unclear, other than Red Bull accepted to proceed as you were before their Friday concession, for this weekend only. So this is an uneasy and temporary ceasefire, rather than peace in our time. It further underlines the folly of changing rules mid-season (especially when safety and/or force majeure isn't involved), as well as that, as in their attempted reinstatement of the Bahrain GP, the FIA doesn't seem entirely familiar with its own rules. This one still has some life in it, as I said.